SearchReSearch: Answer: Fake or real? How do you know? ...how do you know if it's faked or real? These days, with wonderfully competent photo editing software, and the sheer number of people generating content, it's sometimes really hard to tell. Let's tackle each of these Challenges one at a time. I've added a couple of arrows to indicate the direction the light is falling. The sun is clearly up and to the right of the plan (that's why the shadow is falling from the rudder onto the elevator). Notice also that the sunlight makes a pretty sharp shadow; it's full sunlight on the plane. Here you can barely see any shadow. It's a diffuse light, still tinged with the rosy colors of sunrise (or sunset), a kind of light consistent with the time on the clock (although many such clocks are wrong). In any case, as you can see by this small arrow, the shadow is barely there, and it's coming in from the left. Remmij also spotted the roundel on the wing and tried to identify it. 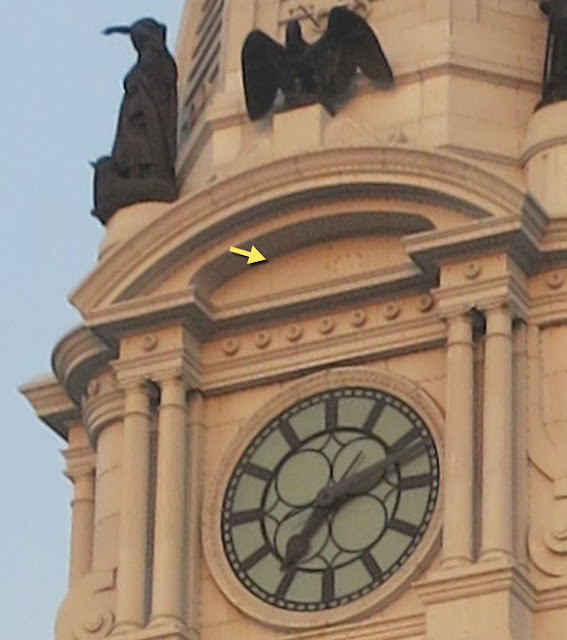 It's hard to ID for sure, but it's not a US mark, and it's unlikely that any other country would be flying F-16s in a tight pivot around Philadelphia City Hall. Remmij ALSO spotted another indicator of being shopped: A cursor left in the image! So this image is clearly a FAKE! How do you start on a question like this? How CAN you possibly determine is a hotel review is faked or not? If you think about it, there are many great reasons to write a fake review (of hotels, restaurants, music recordings, films... anything that people buy AND review will attract faked reviews). Running these two reviews through ReviewSkeptic suggests that they're both real reviews. That's encouraging, but could we do more? One obvious thing to do is to check other reviews by the same person. By doing the obvious query (select the first sentence of the review and search for it), you'll find that this review was written by MarkB, a Level 2 TripAdvisor reviewer. If you click on the TripAdvisor badge for him, you'll see he's written 6 reviews, 5 positive, 1 negative. By following up on all of the reviews he's written, can see see they're all more-or-less in the same tone (and language patterns), and distributed around, not all focused on one place (as would be typical of someone who's doing intentional deception). The same analysis with the second review finds that Madeline75 , a Level 5 reviewer, has been writing reviews for 10 years on TripAdvisor and has written 59 reviews, scattered across lots of time and places. Again, the reviews are very similar in tone and language, and have a good distribution of opinions--some great, some terrible, just what you'd expect in real-life. I'd mark both of these hotel reviews as REAL! There's so much business in fake Jefferson quotes that Monticello.org has done the world a service and written up a collection of their Rules of thumb on How to Spot a Fake to determine if a Jefferson quote is real or not. This page is basically an introduction to text style analysis, and well worth reading. Among other things, Jefferson basically never used contractions--e.g., "don't" in the above quote, or the use of anachronistic language... such as "gun control." When we do the same thing with the 3rd quotation, we quickly find that it's been widely discounted as a fake Jefferson quote, but is still being used in political speeches by Ben Carson, potential Republican candidate. Could he have just mangled a real Jefferson quote? That claimed quote uses the heavily loaded phrase "gun control." If you're going to quote someone, and "gun control" is in the quotation, you're probably not going to get that part wrong. Since Google Books includes all of the writings of the Founding Fathers, if it had been a reasonably frequent phrase, it should have shown up in the chart. But it seems that aside from the use of "gun control" during World Wars 1 and 2 (always in the context of how to guide and point real guns in battle), the modern use of the phrase "gun control" seems to have started in the late 1950s or early 1960s. gave me a number of sources (e.g., WordOrigins.com on "gun control"), all of which seem to concur about the introduction of the phrase (in the modern sense) around 1960. But I thought I'd check a long-running newspaper archive for this as well. I settled on the LA Times (after checking a couple), partly because they have a tradition of writing about "gun control" and also because they have a decent advanced search function that allows one to sort the results by "oldest first." Sure enough, running the search for "gun control" there on their papers from 1881 until 1981 showed exactly the same pattern--before 1960 it was about military fire control; after 1960, it's a political phrase about gun ownership. 1. Pay attention to the angle of the light and shadows in photos. Simple tricks like drawing in the light lines can tell you quickly if the photo has been composed out of pieces. 2. Note the presence of identifying marks on suspect items. There's no way a fighter with a Greek roundel on its wing would be buzzing Philly city hall. 3. As always, searching for tools to help do analysis tasks is a great trick. Before starting this Challenge, I had no idea that an analysis site like ReviewSkeptic existed. Now I have another tool to verify / validate things. 4. Checking quotations is tricky: double and triple check your sources. For these quotes we got lucky. We found one in the writings of Thomas Jefferson, and were able to discount the others fairly easily. But behind each bit of research is a deeper validation of the sites you're reading. Here, Monticello.org is a really authoritative site that gives excellent analyses (including source citations) for all their work. In the case of the 3rd quote, I wanted multiple sources telling me that "gun control" was born (in the modern sense) around 1960. It's a bit more work, but it's pretty compelling. Another Challenge tomorrow! In the meanwhile... Search on! "That the obliquity of the ecliptic, when these elephants lived, was so great as to include with the tropics all those reasons in which the bones are found" is fake. For the real quote you have to replace reasons by regions. Knowing a little astronomy, I noticed the phrase with "reasons" had absolutely no sense, just checked with "regions" on monticello.org and found the right quote. Ah... Sorry about that. I wish I were that clever. It was just a typo on my part. Moral of this story: If you're going to write about real and fake, be careful to copyedit your prose with care! I knew it was an F-16, and guessed the symbol might be Israeli. Searched for "israel F-16 fuel tank", and found the image, on a page talking about "conformal fuel tanks", which were never used by the USA. I also determined the symbol was not israeli by searching for "israel F-16 roundel". 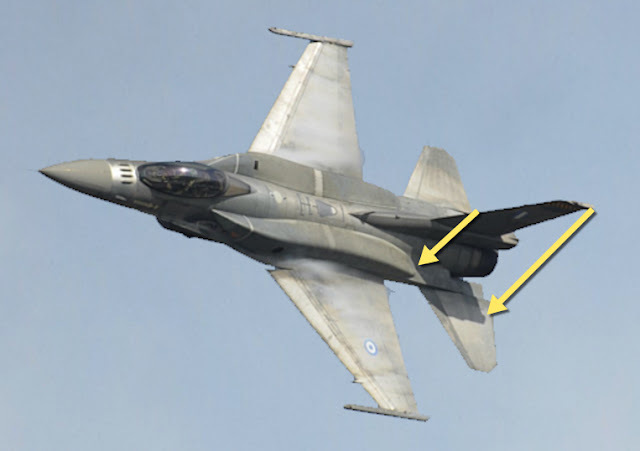 I tried "greek F-16 conformal fuel tanks" and found the right source image on Wikipedia. The one I found has been 'shopped to get rid of the condensation contrail off the starboard wing tip, but they left the condensation forming over the wings on the turn. Well, Dan, it seems that the second quote as written in the challenge "That the obliquity of the ecliptic, when these elephants lived, was so great as to include with the tropics all those reasons in which the bones are found" is fake. For the real quote you have to replace reasons by regions. Knowing a little astronomy, I noticed the phrase with "reasons" had absolutely no sense, just checked with "regions" on monticello.org and found the right quote. I thought this was one of your tricks : an almost right quote, just one word wrong. 5. 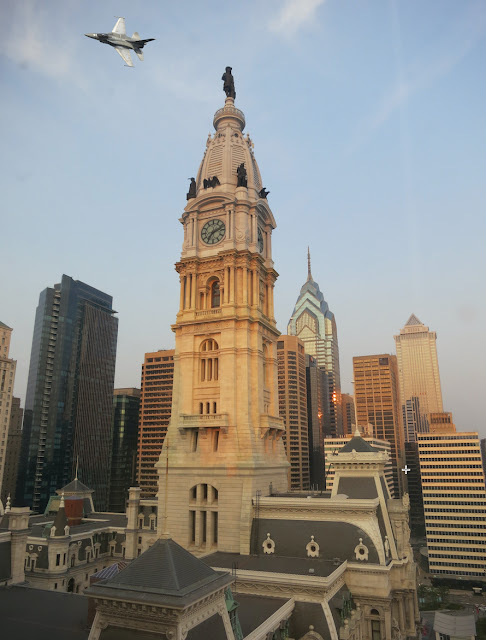 Any time The Dog Star, a Philly cheesesteak & the Shadow are in the same image: double and triple check your sources. btw, jon t U - enjoyable bit of aviation eye/mind candy you found. Dr. Russell, your photo analysis is great, liked specially the clock. Ngram is something didn't think to try and the search lessons are super helpful as always. About error in 3rd quote, Luis noticed on his comments while solving the Challenge. I didn't notice it because my tendency is to read whole paragraph and not word by word. I need to pay more attention besides didn't know the original quote. Remmij; thanks for sharing your process and links. Roundel was new for me. The video verification looks great and it is also something new. I don't know if anybody linked to this previously, but here's a pretty thorough piece on how to check the veracity of a photo. Here is some new research that was published recently on an algorithm designed to catch fake feedback.